Widely ranked among the Phillies' top 10 prospects, right-handed pitcher Franklyn Kilome was one of the most excited inclusions on the Class A Lakewood BlueClaws' roster heading into the season. A disappointing effort in the early going hasn't shaken the youngster's frame of mind though and he's focused on showing the skills that got him loads of attention. The Dominican Republic native, touting an upper-90's fastball, had an impressive campaign with the short-season A level Williamsport Crosscutters last year, posting a 3-2 record with a 3.28 ERA and a 6.6 K/9 mark in 11 regular season outings. This season did not get off on a similar foot for Kilome, however. In three starts for the BlueClaws, the 20-year-old has a 0-3 record along with a 15.83 ERA and a .435 batting average against. Control has been a concern for Kilome, as he has walked 10 batters in 9 2/3 innings. The poor numbers haven't fazed the youngster, though, and he's anxious for his next outing after being skipped in the rotation, with a day off for the team this past Monday. "Yeah, I figure I will bounce back. I feel really good. You know, I want to get back out there. I pitch on Sunday, so I'm going to do a good job," Kilome shared on Wednesday. Kilome was slated to make his next start on Sunday, but with the BlueClaws' rain out on Thursday, that outing may be pushed back a day to Monday in the last game of Lakewood's home stand. Over the off-season, the Phillies brought Kilome north to work out at the team's spring training facility in Clearwater, FL with a goal of adding muscle to his slim six-foot-six 175-pound frame. The program was successful as he's added strength and several few pounds of muscle. Along with the changes to his body, Kilome's mechanics were updated as well, as the Phils has him alter how he uses his legs. 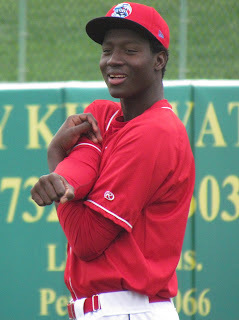 While he's adjusting to so much, including the cold April weather after never having pitched in temperatures below 50 degrees, Kilome cites advice from his coaches as a key factor in what keeps his confidence high in the competitive South Atlantic League. "They talk to me every day. They say, 'You're going to be okay.' We all know it's a process, so they say, 'Stay confident', just like that, 'Keep going and never give up.'" With Kilome returning to the mound in the coming days, here's hoping his command gets on the same level as the belief he has in himself and we get to see the return of the promising prospect that had a break out campaign last year.